Are you a game designer or developer looking to defy the odds and find a partner to bring your ideas to life? Then join the Magic Bytes network of developers! 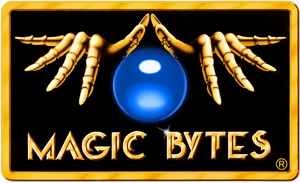 Here you can attain that dream by becoming a part of the gaming community through Magic Bytes’ exciting new projects. We are looking for programming teams, independent game engineers, indie programmers & graphic artists to join our network of professionals and help us achieve our goals on a project-by-project basis. We have our own ideas for games, but we welcome your new ideas too. Magic Bytes is committed to provide the necessary funding needed to hire freelancers and assist in international localization, marketing, and public relations for all partners. “How much does the job pay?” On top of standard market rates, our compensation includes incentives. “Can I earn royalties?” Yes, all major team members have the ability to earn royalties. We believe in video games and in the work we and our partners can do. For us, the best way of showing our appreciation is by making sure everyone is recognized for their efforts. This is why profit sharing comes as a standard to us. And it can become a standard to you as well. “Where are you located?” Although we are able to arrange meetings in Orlando, Florida and Bielefeld, Germany, the majority of our team works remotely from the comfort of their home office. A lot can be done in Cyberspace! “What languages do you speak?” Currently, our recognized languages are English and German, but Magic Bytes will soon have local support in China and India. If you’re looking to leverage your skills, work from home, and earn a higher income doing what you love, then joining the Magic Bytes network of professionals could be a great option for you! Ready to apply? Our application form is waiting for you further down on this page. Platforms: Our games are supported on gaming consoles, PCs, and mobile devices. Strong Portfolio: Although impressive AAA production credits is not a requirement, we do expect all applicants to have a strong portfolio of their work. We encourage anyone who is interested not to hesitate to reach out. We enjoy reviewing the work of today’s creative professionals. If interested in applying, please send us your portfolio and credentials. Upon receiving your credentials, we will review your work and provide you with feedback, regardless of our decision. Reliability: Magic Bytes freelancers are responsible to provide regular updates on availability and progress. Good Communication: Exchanging information with attention to detail is extremely important. Freelancers are expected to promote and practice good written and verbal communication, as many members working on the same project will work remotely from different areas in the world. Meaningful Contribution to the Team: Magic Bytes freelancers must always remember that they are members of the Magic Bytes team. Members are expected to support each other when needed to complement each other’s strengths and weaknesses. Thank you for your application. We will review it and contact you shortly!